It was one week after Super Typhoon Haiyan, and I was on a global team of volunteers performing emergency mapping work in uncharted areas of the island of Negros in the Philippines. My task was to mark the footprints of buildings — or where buildings had been before the storm blew through and destroyed them. Our team split up, each of us taking a block of about two square miles. I wasn’t actually on the ground in the Philippines. I was on my laptop at Office Squared in Burlington. About 20 of my fellow volunteers shared that room; hundreds more were spread out all over the world. The crowd in Burlington included geographic-information-system professionals but also students, local techies and others with no cartographic experience. “In a situation like this, people want to help, and sending money doesn’t necessarily feel as involved or as tangible,” said Bill Morris, a local digital cartographer who runs the firm GeoSprocket. Morris organized the event in conjunction with Code for BTV’s monthly meetup series. Hegman joined about half a dozen Middlebury students majoring in environmental studies or geography at the event. “[The students] knew how to do it, and they felt like they were being useful and making a difference,” he said. But prior experience wasn’t a necessity; so-called crisis mapping is easy even for mapping novices like me. All it takes is a desire to help and some rudimentary tracing skills. Our job as volunteers was simple: Use a web-based mapmaking tool called OpenStreetMap to trace elements of satellite photos of areas of the Philippines damaged by the typhoon and save them to the map database. We traced roads and rivers and outlined building footprints — indicating with more notes in the metadata when the building appeared to have been reduced to a pile of rubble. OpenStreetMap is the web-based mapping software of choice for do-gooder cartographers: Imagine the functionality of Google Maps combined with the anyone-can-edit freedom of Wikipedia. It’s an entirely open-source project, and — unlike most online or hard-copy maps — the data are free to all regardless of intended use. The “CrisisCamp” in Burlington was one of several that day; similar events took place in cities in Canada, Nicaragua and Germany, to name a few. 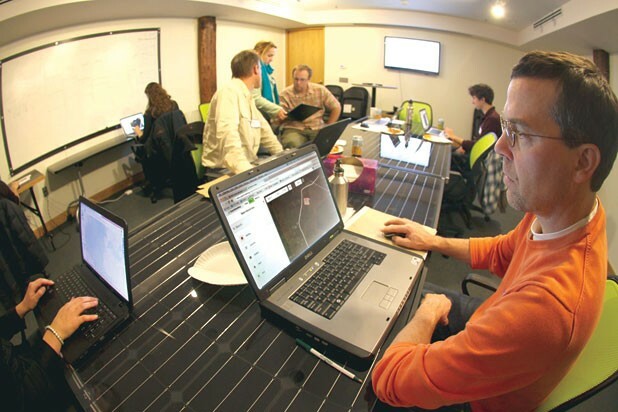 The worldwide effort was coordinated by the Humanitarian OpenStreetMap Team (HOT for short), an international team of organizers who unite after a crisis to work on the logistics of assigning OpenStreetMap tasks. The first HOT project on which Morris volunteered was crisis mapping after the 2012 earthquake in northern Iran. The master “task” file put together by HOT split massive areas into small blocks. The first area I was assigned appeared to be a large farm outside Cadiz City. Using imagery from before the storm, I mapped out this farm down to details as obscure as shacks and footpaths between fields. For a later task, I used satellite photos taken after the storm, when destroyed buildings and washed-out roads became visible. My maps weren’t set in stone: OpenStreetMap editors can check other users’ work and make adjustments if need be. More experienced users can make those edits official in the database. Of course, the mere act of plotting roads on maps doesn’t help storm-stricken Filipinos to recovery. The crisis mapping of globally distributed volunteers is useful because it guides the relief work that’s happening on the ground. The OpenStreetMap software encourages this use; a viewer can see the maps in “humanitarian mode,” which displays road and building damage as marked by editors. According to a post on the Atlantic website last week, the American Red Cross now uses open-source data and free software in its humanitarian-aid projects. Red Cross information management specialist Helen Welch told the Atlantic that her workers print the maps multiple times a day to keep up with the latest updates. Maps that have been updated based on after-the-storm data show Red Cross volunteers where to go and how to get there on roads that are relatively unscathed. Other groups using updated maps include Doctors Without Borders and the UN’s Office for the Coordination of Humanitarian Affairs. Some relief workers use printout versions of the digital maps; others update memory cards for use with GPS devices. As of Monday afternoon, 1171 volunteers worldwide have added features to OpenStreetMap in the Philippines since the typhoon hit. Morris says the Burlington crisis-mapping session alone resulted in about 14,000 edits to the map — though, given the difficulty of tracking the source of edits, the real number was likely higher. I’ve already lost track of which sections of the map I edited — the HOT site now assigns me a new task when I visit it. But, as long as there are paths through the sugar-cane fields and mountains of the Philippines, there’s more work to be done — and I hope what’s been done so far has made the relief efforts more useful to the people who live there. The original print version of this article was headlined "On the Map"